Manufacturers will do everything they can to prevent you from collecting on their mail-in refund offers and half of the consumers that purchase an item because of the rebate will not take advantage of it. The reason we include manufacturer mail-in rebates as a scam is because when manufacturers promote a product by presenting a mail-in rebate they do everything possible to lower the dollar amounts paid out. They call this “breakage.” This doesn’t mean that they don’t intend to honor all properly submitted rebates but they are aware that 50% of the consumers that purchase an item because of the rebate will not take the benefit of it. From this statistic it’s easy to see why so many manufacturers tender rebates on their goods to consumers. If it stopped there I would not be writing this now because a consumer’s failure to mail in a rebate hardly constitutes fraud. Rebates cross the line and become a scam when they contain complicated submission rules, restrictions on the time to mail in the rebate or find arbitrary reasons to deny rebate requests. Companies running rebate promotions for manufacturers actually compete for the highest rejection rates and include the complication of their rules as a reason why they should be selected to administer product rebate offers. The manufacturer may have initially begun rebates with the best of intentions, but can be seduced into locating techniques to limit redemption. When you are making an offer but create so many obstacles and hoops to jump through that redemption becomes difficult to near impossible, you’re treading the line between respectable business and fraud. Read the entire rebate form. Before you purchase a product with a large rebate, read the form carefully to make sure you can qualify. Double check the purchase and mail in deadline dates. Sometimes a manufacturer will delay delivery of your purchase just long enough to make sure that you no longer qualify. 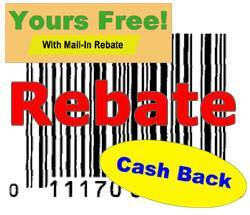 You will almost certainly receive what you bought but your rebate will no longer be valid. Choose the easiest rebates available. Online rebates are processed faster than mail in. Some of them even help you find the right forms, send them and then track your rebate. Another plus is a retailer that provides you with a copy of the receipt and the form right at checkout to help ensure you receive the rebate. Fill out all forms completely. If you fail to provide required information your rebate request will be denied. Read the form carefully and double check it before you send it in. Don’t miss the mail-in deadline! Use the correct UPC code. Some product boxes have more than one UPC code and sending in the wrong one may result in a rebate request denial. If you’re not sure which UPC to send in, call the customer service number to confirm. If you have multiple rebates and copying the UPC is allowed but you can’t photocopy it, take a digital photo of the UPC and send that in. Some rebate offers require you to cut out the original UPC so that you can’t collect a rebate and then return the product. Make sure you provide the UPC according to the rebate’s instructions. Be sure to copy all completed rebate forms, receipts and any UPC codes utilized. This could help prove you sent in your rebate. If the rebate involves a lot of money you may want to consider sending it via certified mail with a return signature request. If there’s any dispute from the manufacturer, you can prove your rebate was sent and received on time. Follow up on your rebate. We recommending using a spreadsheet or other tracking method. It can take six to eight weeks to receive your rebate and some can take even longer. If the time it’s supposed to take has passed and your rebate has still not arrived contact the manufacturer to find out what’s happened. Don’t be afraid to complain because if there’s one thing manufacturers hate it’s a bad reputation. Has there ever been a successful class action for rebate fraud. I’ve got a doozy right now. LOL, you must have missed the Arbitration Agreement you’re forced to sign that waives your right to sue or CAL. You can go in front of an “independent” arbitrator who will obviously be biased towards whoever is giving them business. This may be a new way to cheat us out of rebate money. I purchased 4 Cooper tires at Discount Tires. Sent in the paperwork for a 50.00 debit card. It went very easily. The Master Card by Citi was received. I used the card and only 10.00 was available.. tried it several times over a week. Called the credit card company. They said the 50.00 was spent! Sent Cooper email. They said they authorized Citi to send me a card for 50.00 and it shows the 50.00 was spent! They sent me back to Citi!!! So, I got the card but only got 10.00 instead of 50.00 Can anybody think of a way to get this to work? I am tempted to call my AG office in MN. Its not that 40.00 will break me, it is the principal…. We had trouble with our Cooper Tire rebate too. The dealership called them and made them send us a new card. I’ve had trouble with the last three rebates I’ve sent in recently.I always keep copies. The phone people who answer the inquiries all seem to be from India. The dealership fixed the Cooper Tire one, I had to file a complaint with the Better Business Bureau for the second one and just am waiting on the third one to see if the company makes good on it. We are being scammed. I fight no matter what the amount is. What is right is right.